Yesterday the rail press and other interested parties gathered at the RVEL engineering works in Derby to see Porterbrook leasing unveil their prototype refurnished Pacer, the 144e. The timing couldn’t have been better as the previous day the Transport Minister had been forced to announce delays to some important rail electrification schemes. Over the next weeks you’ll be able to read in-depth articles on the vehicles so I’m only going to give you a few basics here. First, I want to stress that this is a prototype. It’s showcasing what could be done to a Pacer (or any 150xxx series DMU), not necessarily what will be done. It’s a menu of options, which includes new seats, internal trim and a toilet module that makes the vehicle PRM-TSI compliant. 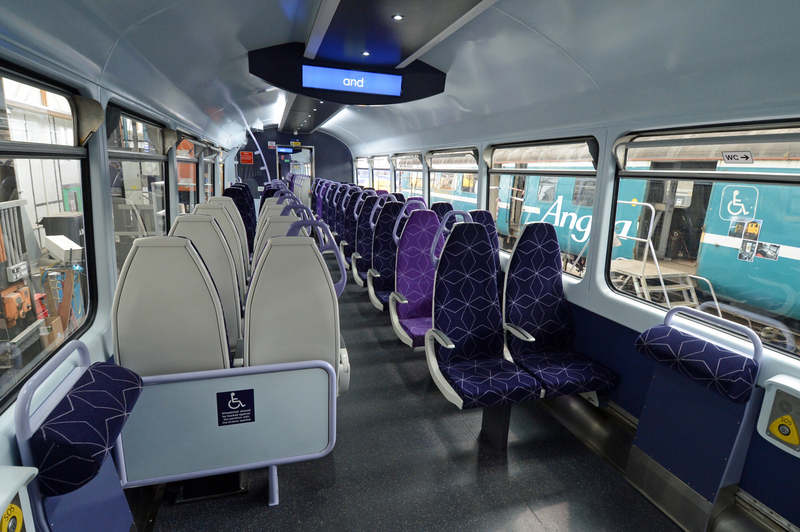 Porterbrook have gone further and fitted 144012 with wifi, a vastly improved Passenger Information System (PIS) and a TV screen that shows either adverts of passenger information. They’ve also fitted a rather clever inbuilt ramp to assist with wheelchair access. 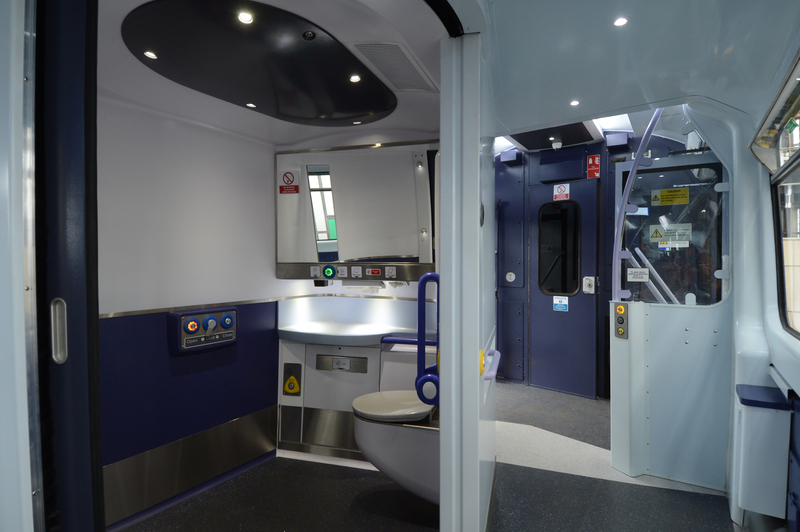 The vehicles centre of gravity has been lowered by the removal of a large water tank (the new toilet requires far less water) and the luggage racks, so you should expect a better ride. When you have a look at the pictures you’ll see it’s unrecognisable as a pacer. 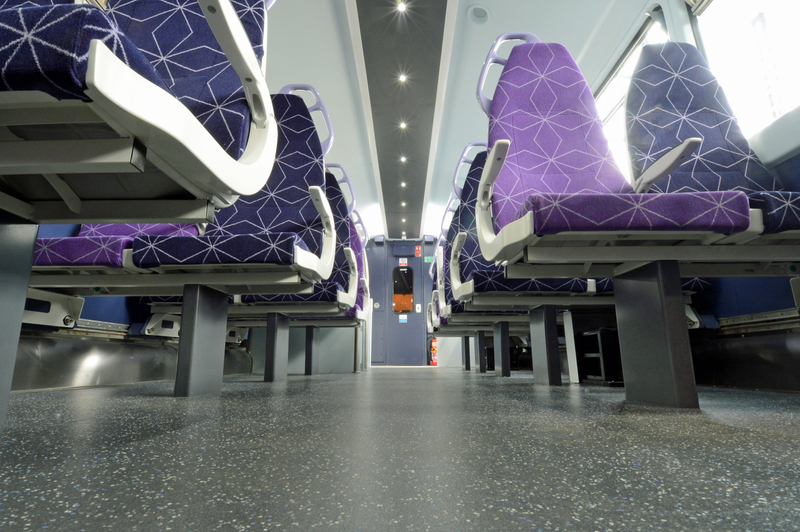 My RAIL colleague Richard Clinnick described at as looking like an Electrostar on the inside. There’s one other important thing about the 144e – it would cost around a third of the price of a new DMU (& even less if you took some of the frills out). 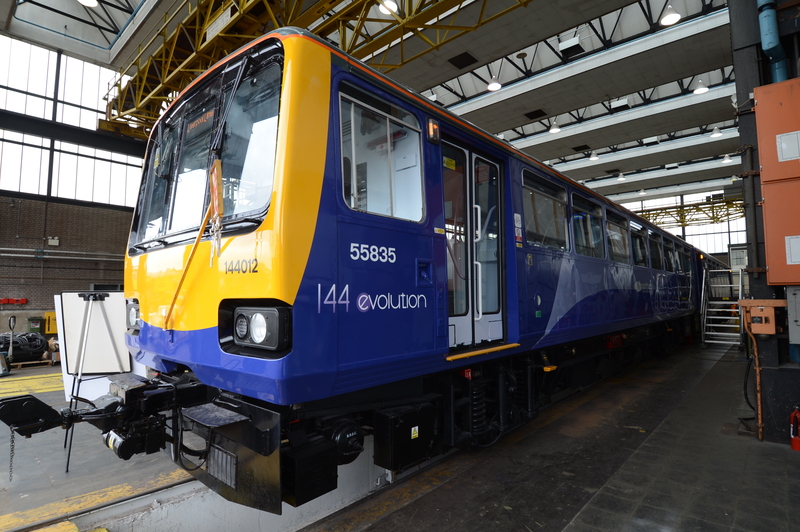 144012 will enter service with Northern within the next month or so. When it does, why not check it out for yourself? 144012 sports a new livery. It also sports a new dot-matrix destination screen and a forward facing camera in the left-hand windscreen. The interior seen from the two wheelchair spaces. The toilet module is more Star Wars than BR built Pacer! You can see a full range of pictures on my Zenfolio website here.